NEW DELHI — India's single-engine fighter program, worth $12 billion, is unlikely to be "decided before 2019," analysts and officials say, even as the Indian Air Force has decided to hold flight tests of Lockheed's F-16 Block 70 and Sweden's Gripen-E, the two aircraft competing in the program. Restricted expressions of interests were sent through Indian embassies to "some overseas participants" to take part in the program in October last year to elicit responses to produce single-engine fighter aircraft in India. 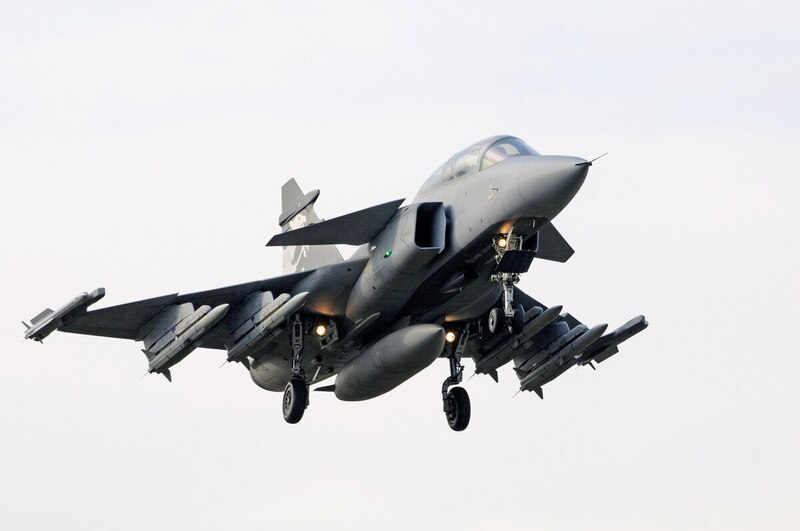 Lockheed Martin offered to shift the assembly line of its F-16 Block 70, and Sweden offered to build the Gripen-E aircraft in India with technology transfer. The F-16 fighter aircraft did not come up for discussion during last month's summit talks on June 26 between Indian Prime Minister Narendra Modi and U.S. President Donald Trump in Washington, said a Ministry of Defence official without commenting on the outcome of the talks. However, analysts and officials are skeptical whether the program would come to an early decision. Some analysts even say the F-16 will never be bought by the Indian Air Force, or IAF. "There isn't now even the slightest IAF interest in the F-16 Block 70 or any other variant," said Bharat Karnad, professor of national security studies at Centre for Policy Research. When asked about the outcome of the flight trials the IAF will conduct, Karnad said, "Nothing, it will take time and delay any decision to beyond the 2019 election. Thereafter, the medium multirole combat aircraft, or MMRCA, metrics will still apply, and the F-16 will be rejected." The F-16 and Gripen were both rejected after flight trials during the 2007 MMRCA tender, which was finally scrapped in 2014, leading to the outright purchase of France's Rafale fighter aircraft worth $8.8 billion that was inked last year. An IAF official said that this time, only limited flight trials of the F-16 and Gripen will take place, which will be restricted to the upgraded components that were not in the 2007 MMRCA tender. Daljit Singh, a retired IAF air marshal and defense analyst said, "The F-16 and Gripen fielded during the MMRCA selection did not have all the systems that the IAF would look for in single-engine fighters. AESA radars and EW systems have recently been integrated on the F-16 Block 70 and Gripen E, and they would be required to be evaluated." "The time for evaluation would be lesser than the previous evaluation, as only two fighters would be evaluated, and the majority of the capabilities have already been tested," Singh added. However, analysts and officials are unanimous in their view that no decision on the program is likely immediately. In addition, the program is to be built in a newly announced Strategic Partners policy, which was notified in June. "The chances of seeing any program under this SP program in the near future are slim til the MoD sorts out key issues relating to IP, especially under an unfavorable 49 percent ownership limit for foreign vendors," said Pushan Das, a defense analyst with Observer Research Foundation. Another IAF official said, "There could be delays based on IAF asking for more and thereby delays due to integration testing, etc." "In my opinion, in the current scenario with home-grown light combat aircraft, or LCA, getting produced and with LCA Mark-1A and an order of 83 cleared by the government already, I do not foresee an immediate decision on any other single-engine fighter aircraft soon," the IAF official added.